The Tree Fu Rangers are trying to win their 'Green Fingers' badge but the carrots on Ariela's ranch have grown huge and gone crazy....with the help of some seeds from the Big World and Zigzoo's Harvesting Hands invention! Join Tom to help him perform Big World Magic to restore calm to Treetopolis. 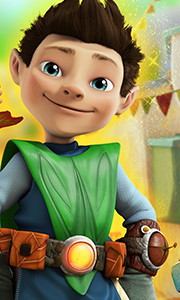 Save Tree Fu Tom from the crazy Carrots of Doom plus 5 other exciting adventures. EPISODES: CARROTS OF DOOM PICTURE THIS DRAGON FRUIT F..
Tom needs your help to save the day in 6 action-packed Tree Fu Adventures! Tom, Twigs and all their friends have lots of fun-filled adventures around Treetopolis but when trouble strikes it's up to him to save the day! Time for you to do Tree Fu with Tom and make the moves that turn his magic powers on! With your help Tom can make Big World Magic and tackle anything from warbling Warble Weeds to stopping those naughty Mushas make mischi..
Own Tree Fu Tom - Spring Into Action DVD from Deff, DVD, Blu-Ray & 4K Video Specialists - Free UK Delivery..
Another collection of episodes from the CGI-animated show for children featuring the vocal talents of David Tennant and Sophie Aldred. Tom Powers (voice of Aldred) seems like an average eight-year-old boy. However, Tom has made an incredible discovery. In the woodland near his house is a special tree that houses Treetopolis, a city inside a tree trunk that he is able to access as a miniature version of himself and interact with the weir.. It's Time For Tree Fu! In Weather Bother Zigzoo invents a new machine to create the perfect weather for each of his friends, but trying to keep everyone happy soon ends in catastrophe. Whether it's hot, cold, icy or back to normal, Zigzoo just can't please anyone for long! Tom needs help from You to do Big World magic and overcome the weather chaos caused by his demanding friends. Join Tom and friends in Weather Bother and 6 other excit..
Own Tree Fu TomTree Fu Go DVD from Deff, DVD, Blu-Ray & 4K Video Specialists - Free UK Delivery..
Own Tree Fu Tom - Red Magic DVD from Deff, DVD, Blu-Ray & 4K Video Specialists - Free UK Delivery..
Own Tree Fu Tom - Toms Big Spell DVD from Deff, DVD, Blu-Ray & 4K Video Specialists - Free UK Delivery..